I am finally getting over 2 1/2 weeks of the “crud” going around, and the lingering cold has really put a dent in my cooking. Besides soups and on-the-go meals from our local health food store, I haven’t been inventive in many meals. 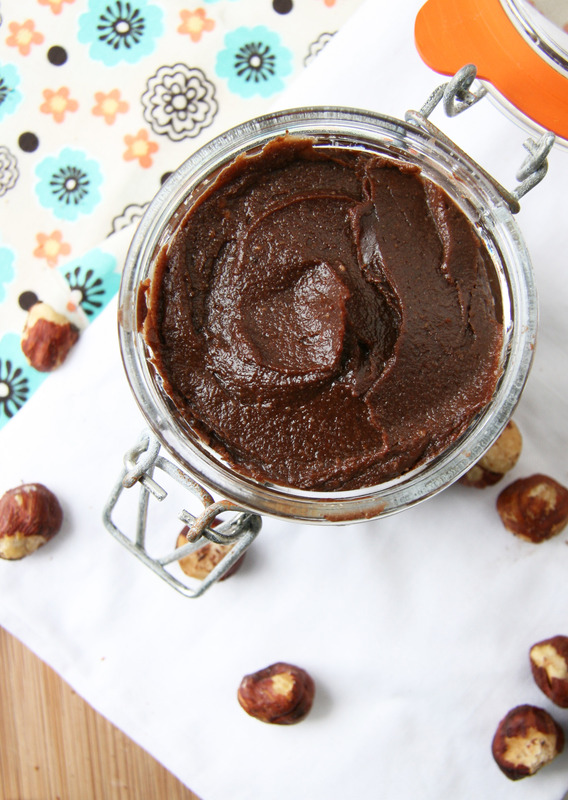 However, this chocolate hazelnut spread pulled me out of the slump…it’s creamy, chocolately goodness and rich, nutty flavor made my taste buds sing and I knew I was on the track to recovery. I’m quite comfortable with making homemade nut butters (ie. nut butter madness post), yet it’s been a while since I posted a new flavor combination. 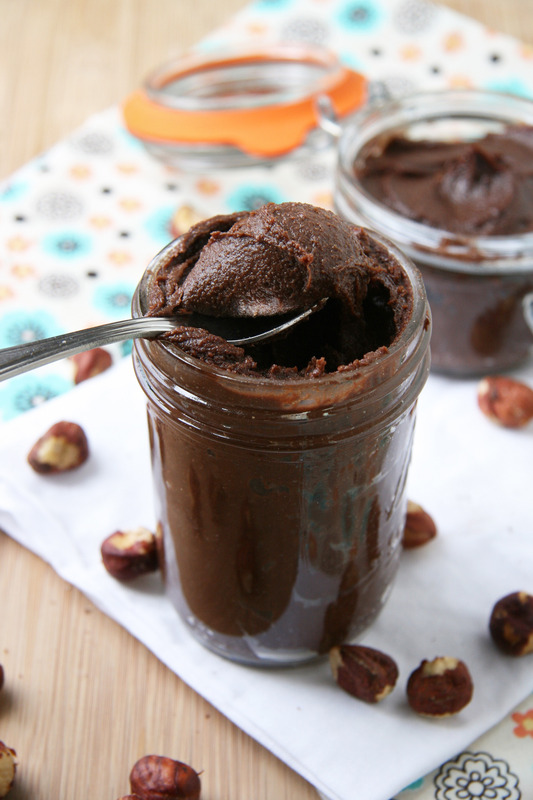 I also realized I’ve never posted a chocolate nut butter….what???? It’s about time! 2. Add hazelnuts to a large baking sheet and roast for 10-12 minutes until lightly browned and some skins have loosened around the hazelnut. 3. Place the roasted nuts in the center of a damp kitchen towel (use an older towel or dark colored one). Bundle it up and rub the nuts for a couple minutes to loosen the skins. Pick out the “skinless” nuts and place into the bowl of a food processor. Repeat until most of the skins have come off and add the remaining nuts to the processor (it’s ok if there are stubborn ones that are difficult to remove). 4. 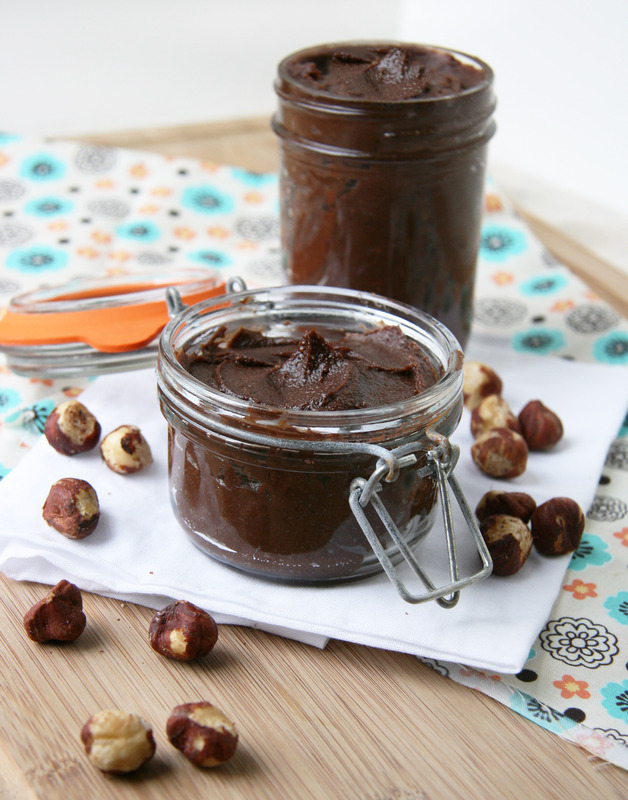 Process the hazelnuts for 5-6 minutes or until you achieve a creamy nut butter. You may need to stop and scrape the sides of the bowl every couples minutes or so to help it along. 5. Add the oil and process for a minute or so until smooth. 6. Add the remaining ingredients and process again until fully incorporated and really smooth, this took me another 5 minutes. Taste the spread and adjust salt and sweeteners to taste if desired. Makes about 1 1/2 cups of nut butter. Store in jars or containers in the fridge. Enjoy with a large spoon, spread on toast or use in your favorite recipes. 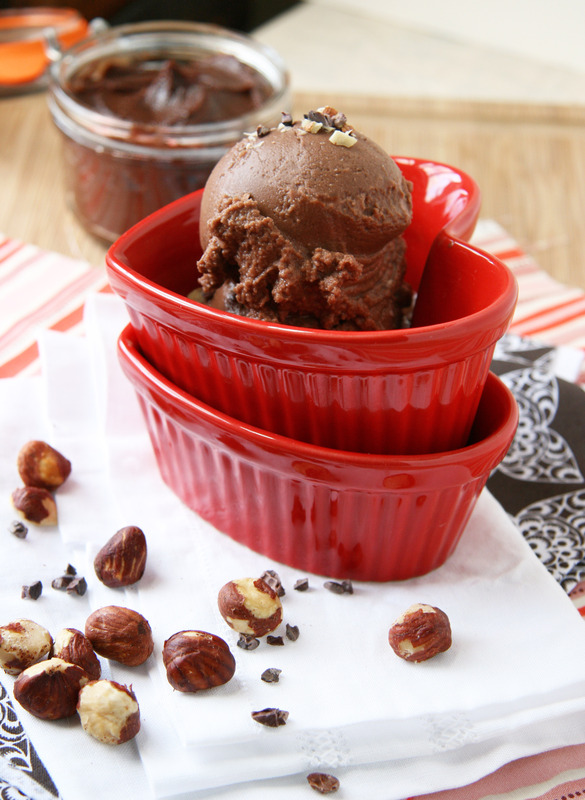 “Nutella” Ice Cream (Dairy-free) coming soon! Pingback: » 4 Great (and Healthy) Gifting Goodies for Christmas!